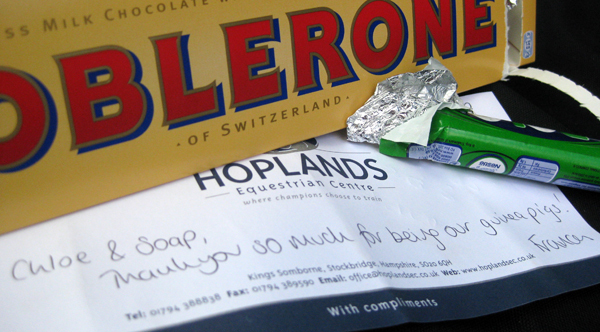 Last week I received a text from my sponsor Frances at Hoplands Equestrian Centre asking if I was free to be a guinea pig rider for an Equestrian Coaching Committee training day. Having done a few guinea pig impressions for a similar thing with the BSJA last year I found the whole thing a really interesting experience so said yes. We arrived a little early so I took Soap for a quick hack round the XC course to warm up, the sun was shining, everything looked lush and green, and it was just lovely to be mooching about in such pretty surroundings. 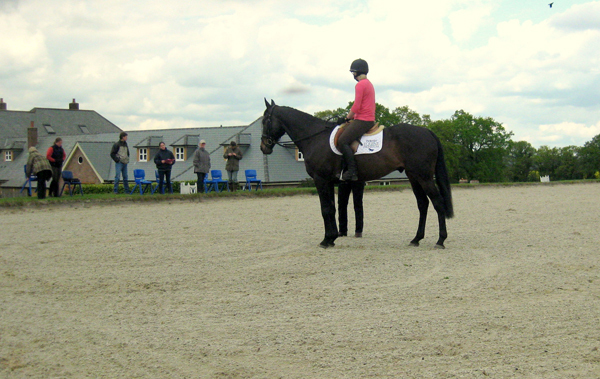 It was soon time for action so we made our way to the international sized dressage arena to meet our coach. 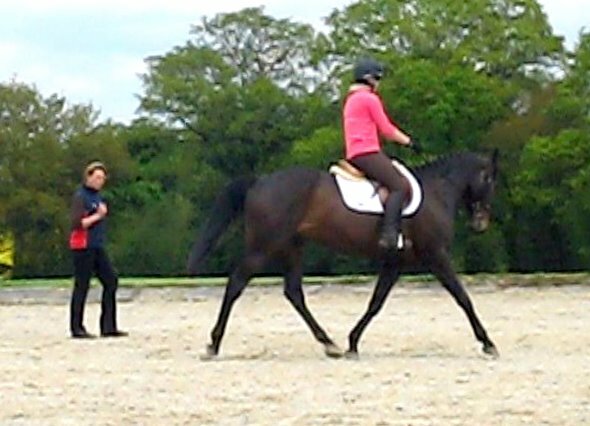 I had volunteered for 1 hours flatwork under the instruction of Caroline Moore FBHS, and BE accredited coach. I knew of Caroline because I went on a BE CDT day back in March 09 (click here to read about that) and whilst researching that I discovered that she was one of the 6 members of BE’s CDT, what I didn’t know was that she was also a rider for the 2007 Hong Kong Olympic test event, and BE International Young Riders Selector eeeeke! No pressure then! The lesson was approximately 30min of ridden work, taught by Caroline and being watched and assessed by some existing coaches who were on the course to improve and advance their own teaching skills. Then after the ridden work the onlooking coaches gave their comments and questions. We then did a really helpful exercise trying to ride an accurate 15m and then 20m circle. 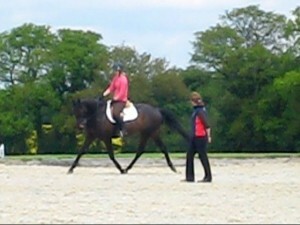 Initially I rode my 15m circle in trot making 26 rises round the whole circle. Caroline explained that a 15m circle should be completed on 16 rises so we had 10 to lose! This is harder than it sounds but after a few attempts we managed to get near at 18 and spot on a few times at 16. This test of accuracy really showed up the difference on each rein and my lack of focused spatial awareness. Our homework to improve our accuracy is to make some markers for the school, measure out a 10/15/20m circle, put down the markers and ride the correct sized circle, with the correct number of rises, until we have it off pat. At the end of the lesson the other coaches appraised Caroline’s lesson and I gave my feedback. One comment that I didn’t agree with was that her lesson contained too much information. It has taken me ages to find an educational and informative instructor in Amanda Brewer, and I love her lessons so to find out that Caroline taught in a content heavy style too was really pleasing. For me a riding lesson should be no different than teaching any other subject. I want information, examples, explanation, and to be educated, not just left to my own devices for circles on end to ‘feel’ the correct moment. If I could have changed anything about the lesson I would have liked a print out at the end of all the things I had to go away and work on as despite scribbling down my notes in the car on the way home, I’m sure I will have missed something. So all in all Soap and I finished as 2 very happy guinea pigs, and were even more chuffed when Frances gave me a Toblerone and Soap some Polos for our efforts!